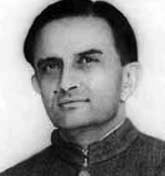 Vikram.A.Sarabhai, was the main personality behind the launching of India's first satellite, Aryabhata in 1975. He was born in Ahmedabad, Gujarat in a family of industrialists. He was also responsible for the Equatorial Rocket Building Station at Thumba. Sarabhai set up the Ahmedabad Textile Industries Research Association, a laboratory for research in Physics and the Indian Institute of Management. Sarabhai was the second chairman of India's Atomic Energy Commission and the Indian Space Research Organisation. Sarabhai's study of cosmic rays under the eminent scientist Dr. C.V. Raman, revealed that cosmic rays are a stream of energy particles reaching the earth from the outer space, being influenced on their way by the sun, the atmosphere and magnetism. This study helps in observing terrestrial magnetism and the atmosphere, the nature of the sun and outer space. He was conferred 'Padma Shri' in 1966 and was posthumously awarded 'Padma Vibushan' in 1972. He was also awarded 'Dr. Shanti Swarup Bhatnagar Prize' in 1962. This great scientist could be credited with launching India into space age.